Lani Belcher won two of Great Britain's three gold medals at the Canoe Sprint World Cup 2 in Duisburg, Germany. Belcher and Angela Hannah held off German competition to win the women's K2 200m on Saturday, with Belcher, 25, also taking K1 5000m marathon gold. Britain sent a Para-canoe development team for the first time and Charlotte Wilkinson-Burnett claimed a debut gold in the women's KL1 200m on Sunday. 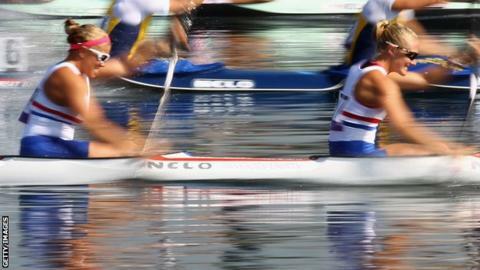 Liam Heath and Jon Schofield took bronze in the men's K2 200m. There was another medal for Britain in the K1 5000m marathon with Louisa Sawers taking bronze, while a WK4 200m crew of Hannah, Rachel Cawthorn, Hayleigh Mason and Emily Lewis came third. Tim Lodge finished third for bronze in the Para-canoe KL3 200m.